Talented, Trainable Gelding For Sale……. 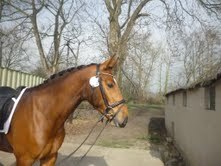 16.1 hh 4 year old handsome bay Hanoverian gelding by Uccello, out of a Laptop mare. He has very expressive paces, with a lovely trainable temperament. He was imported from Germany as a foal and has been with the owner since then. 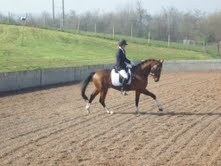 He was backed in January and is proving to be a lovely character, he hacks out on the lanes on his own or in company. He has been to one BD show travelling well and was very well behaved, and received very positive comments from the judges.